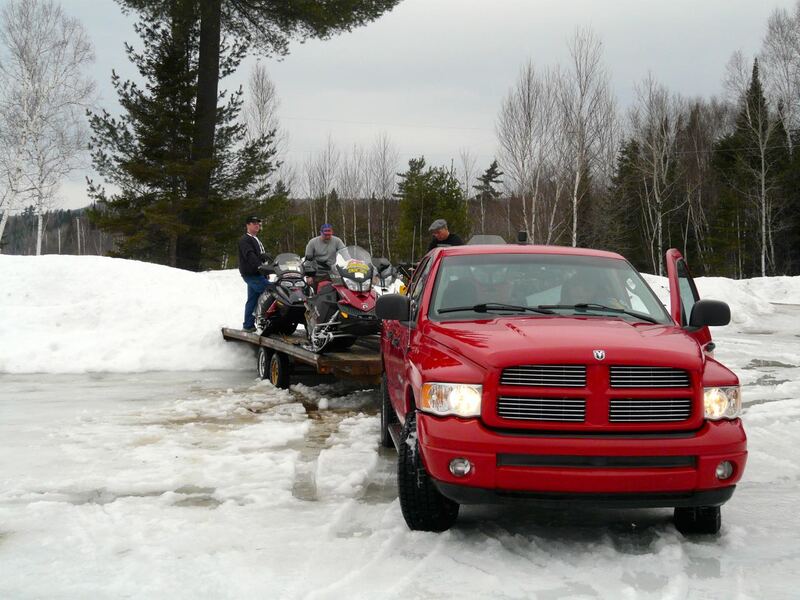 What should you expect during meltdown snowmobile trail conditions? It could be a temporary mid-winter thaw or the first stirrings of an early spring. But you’re bound to encounter a snowmobile ride in temperatures warm enough and lasting long enough to start meltdown snowmobile trail conditions. There’s no point in grooming when temperatures aren’t cold enough to allow a new surface to set up properly. That’s just a waste of money and effort. Besides, when heavy, wet snow sticks to the drags and blades and lumps off onto the trail, the machinery can’t do its smoothing job effectively anyway. 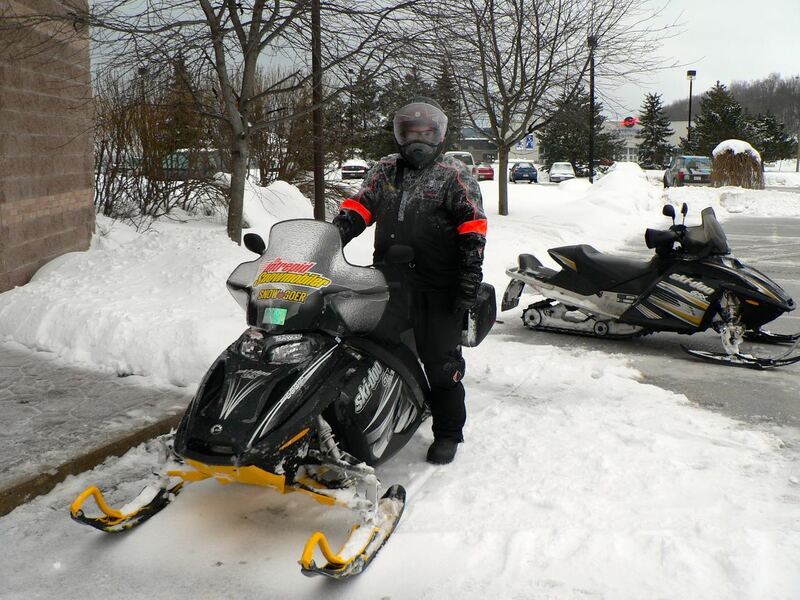 As a result, don’t expect trails to be groomed during meltdown snowmobile trail conditions. Or until it gets cold again. So no matter how smooth a trail was before the mercury skyrocketed, expect your ride to get bumpier the longer the thaw lasts. Road shoulders being used to get from one section of trail to another will be the first to go. Typically, they don’t have much snow at the outset anyway. So you’ll be scratching along bare pavement or gravel before you know it. The same goes for any ploughed staging areas where you may park for the day. Plus parking lots at hotels and restaurants, and the approaches to gas pumps (if not bare already). Not only does bare pavement or asphalt wear your traction products faster (carbides & studs), it’s also harder to steer your snow machine across. Also, watch out for run-off water in road ditches and around culverts. And by the way, if you’re snowmobiling anywhere beside a road, beware of being soaked by puddle spray from a passing automobile! As it melts, any stakes and signposts using the snow for support are increasingly likely to fall over. Downed lake or field stakes may make it difficult to stay on the trail. Moreover, navigation is more challenging when some signs that usually point the way are lying in the snow. Also, try not to run over any fallen stakes or signs, so as not to damage them or your sled. As they say about snow, “sooner or later, it all turns to water” And all that H20 needs someplace to go. 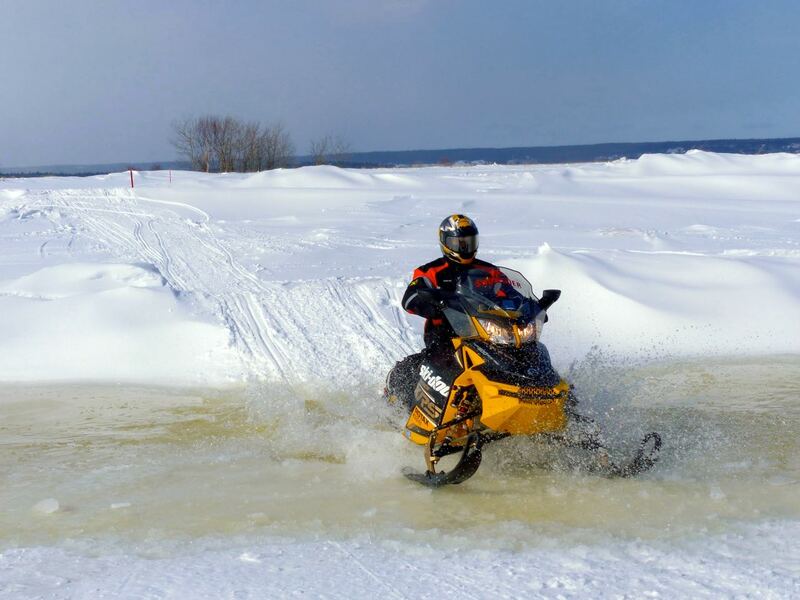 Typically, snowmobilers will encounter it pooled in low lying areas where still frozen ground underneath prevents it from seeping in. Or as rivulets of water running across or alongside the trail, which can rapidly erode the trail base (see next section). Any late-freezing parts of a trail will open up again first and quickly in a thaw. Be careful to avoid sinking your sled or getting sprayed by the spinning track of the sled in front. And make sure to wear waterproof boots to avoid a soaker from water or wet snow. Getting too much water on your clutch and drive belt while driving through deep puddles can be problematic. 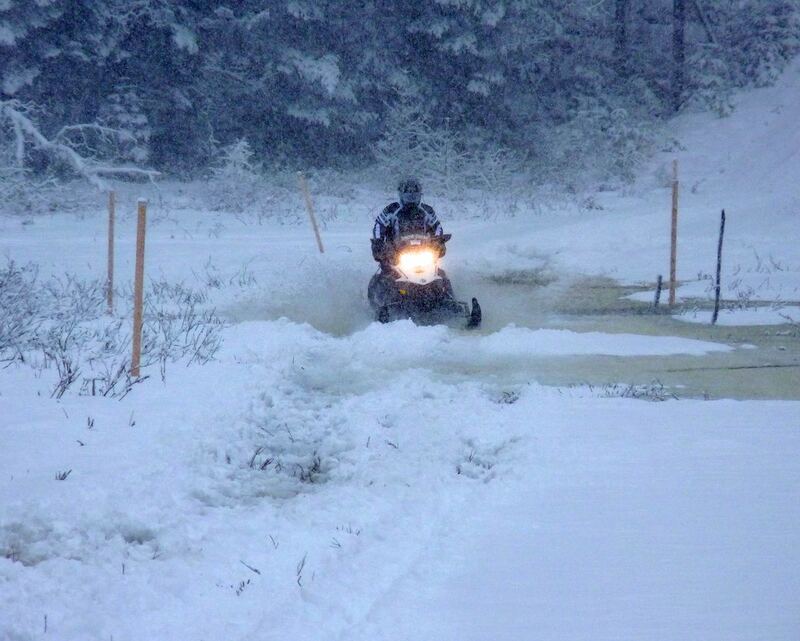 Ideally, a snowmobile club tries to build its trail base as solid, thick and frozen as possible. This helps to better withstand periodic, mid-season thaws. And to extend the trail’s availability longer into March. If the club has succeeded, meltdown snowmobile trail conditions that are temporary shouldn’t cause too much damage (with one exception – see last paragraph of this section). But what if Mother Nature hasn’t cooperated previously? To freeze the underlying ground and provide enough sub-zero nights. And most important, so there’s sufficient snow for regular grooming. Then that trail is considerably more vulnerable to the ravages of thaw. What you’ll encounter during trail base break up varies. Where the base is thin, bare spots and rock will start showing through fast. Especially on south facing slopes. On places like rail beds, you’ll start to feel gravel grating on your skis. If there’s heavy, wet and even slushy snow on the trail, steering will be harder. Plus riding will be heavier thanks to the gunk that will pack into your track and suspension. Combined with the warm temperature, this could cause engine overheating. And be sure to clean out your under carriage before the temperature drops again. Or if you store your sled outside, you’ll be sitting on an immobile block of ice for your next ride. In addition, you may run into new cracks, holes and dropouts on the trail. Many of these appear suddenly by the undermining erosion of running water. 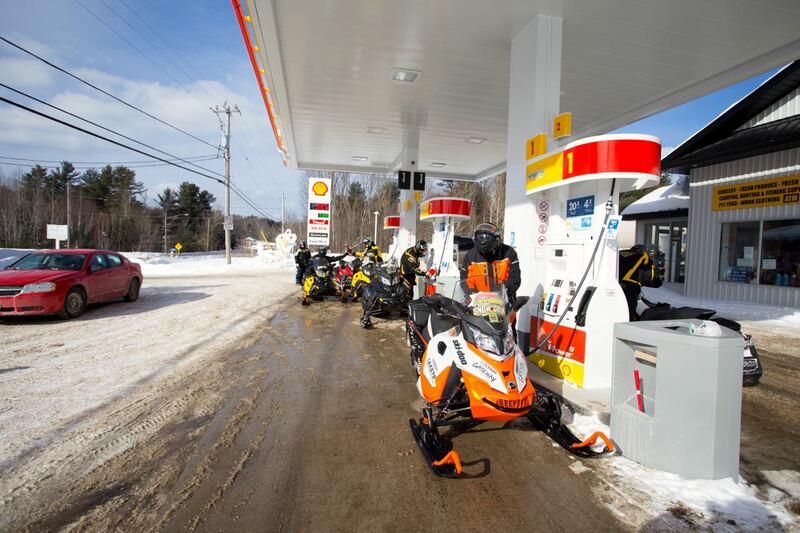 They can easily trap a ski or tip your sled unexpectedly, so take extra care while riding. Finally, the worst damage to a melting trail base can be caused by snowmobile traffic tearing and chewing into snow that’s already getting fragile. You can help clubs protect the trail base by simply staying off the trails. Or at the very least, by riding less (and less aggressively) during mid-season thaws. If it’s warm enough, a layer of slush may form under the snow on lakes and rivers. This sloppy gloop can trap the sleds of the unwary or inexperienced (see waterproof boots, above). 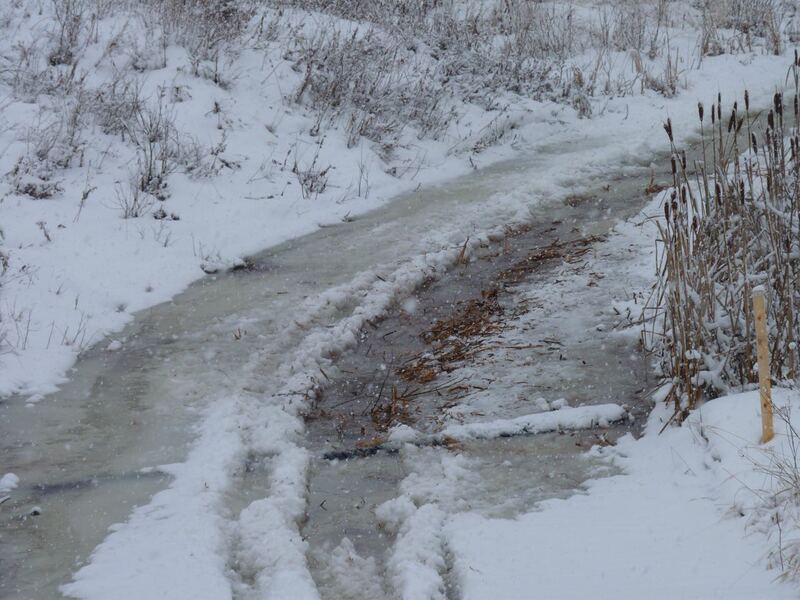 In addition to slush, you may also encounter melt water on ice surface where run-off pools. And holes can even get started through the ice. Worst case, a thaw can certainly deteriorate ice conditions from what they were before. And if they haven’t been great in your area in the first place, your best bet is to avoid running lakes during a meltdown. And staying off until after a prolonged re-freezing has occurred. If you must travel on frozen lakes, only do so where it is well packed along a stake line (assuming it’s still standing) and don’t stop on the ice. So given how inferior the snowmobiling can be and how much damage snowmobile traffic can do to the trail base during a meltdown, I’m going to park my sled until it all freezes up again. What about you? No complaints if you go anyways!